A selection of Clan MacLaren merchandise and gifts is available to buy at the Annual Dinner and Gathering. If there is something you are particularly hoping to purchase, we recommend checking in advance. Throughout the year, Scotclans offer a wide range of merchandise for the Clan Maclaren and many other Scottish Clans. ‘Creag an Tuirc traces the social history of members of the Clan Labhran (the MacLarens and the MacLaurins) who had its origins in Balqhuidder and surrounding districts of western Perthshire. The book concentrates on a 200-year period in the history of the Clan from around 1680 to around 1880, a time of great social and political change in Scotland when there were three Jacobite uprisings. Following the defeat of the Jacobites at the battle of Culloden in 1746, a gradual disintegration of the traditional way of life in the Highlands took place. A major consequence of these changes was widespread emigration of clansmen and women, firstly to North America and later to Australia and New Zealand. Of those who stayed behind, many moved from their traditional homelands and went to work in textile mills and other industries that began to open up in Scotland after 1780. This book covers 190 descriptions of Scottish parishes where MacLarens at one time resided. Over 2,400 clansmen and women are listed. In addition, there are brief biographies of 160 clansmen and clanswomen, and 65 family lines are detailed. The biographies range across all walks of life. It is hoped that if you have MacLaren or MacLaurin roots you will be able to find some reference to these in this book. 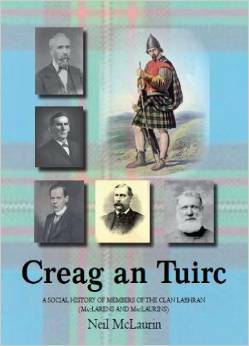 The revised 2014 edition of Creag an Tuirc is available from Melrose Press at £25 plus postage, or from Amazon. This is a fascinating history of the Clan Labhran, from its origins up to the 20th century, written by the mother of the present Chief, Donald MacLaren of MacLaren and Achleskine. Margaret guides us through the connections between clans forged through marriage and the comings and goings of clans in the lands around Balquhidder. She gives an excellent, detailed description of the clan system through the ages and includes illustrations and maps. The concluding chapters deal with the principal branches of the Clan, its Septs and Heraldry. In the appendices Margaret has included the Constitution of the Clan MacLaren Society. Apart from the wealth of information contained in this volume, it is well written making it a joy to read. This book brings together a wealth of information and history about the clans who have inhabited Balquhidder Glen. We begin with a journey from Callander to Kingshouse and then proceed to learn of the various inhabitants from early settlers in the Bronze Age up to the 20th century and their interactions. The Braes o’ Balquhidder is available on Amazon.